The story of the Lady Lovibond is an old tale from the British Isles about a sailing ship. 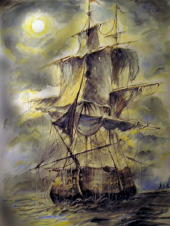 She was a three-mast schooner that went hard on Goodwin Sands on Friday the Thirteenth, February, 1748. The ship’s crew and 50 guests, all aboard to celebrate the wedding of Capt. Simon Peel, perished. As the story is told, the helmsman, a man called Rivers, was a very jealous man who was in love with the bride. While Captain Peel and his guests were below deck, Rivers purposefully drove the ship onto the treacherous sands while in a fit of jealous rage. An English ballad gives some details of the voyage although there is nothing to determine the accuracy of the information. It claims the vessel was bound for Oporto, Portugal, with a cargo of flour, meat, wine and gold. Rivers served as the first mate of the ship. According to the ballad, he and the captain’s new bride had been romantically involved but she wanted a better life than he could afford to provide as a common seaman. Thus there was bad blood between Rivers and Peel over this marriage, although Peel apparently was unaware of it. The result of it all was a disaster that went down in English lore as a fine haunting story of the sea. It is said that the wrecking of the Lady Lovibond has been seen on the anniversary of the disaster. Sailors say the ghostly image of a three-mast schooner is seen by passing ships as it rushes to its destruction on that reef. The last reported sighting occurred in February, 1898.